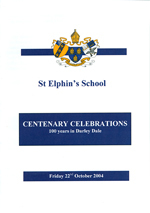 There were two major Celebrations held during the life of St Elphin's School – the first in 1994 to celebrate the 150th Anniversary of the Founding of the school, and, the second in 2004 to celebrate 100 years of the school being in Darley Dale. 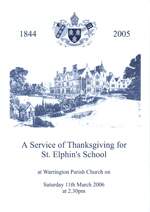 In addition there was A Service of Thanksgiving for St Elphin's School held in 2006. 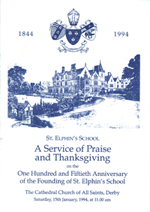 A Service of Praise and Thanksgiving on the 150th Anniversary of the Founding of St Elphin's School was held at The Cathedral Church of All Saints, Derby on Saturday, 15th January, 1994 (1844 - 1994) at 11.00am. 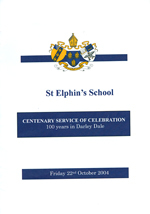 A Centenary Celebration was held to mark 100 years of St Elphin's School being in Darley Dale. 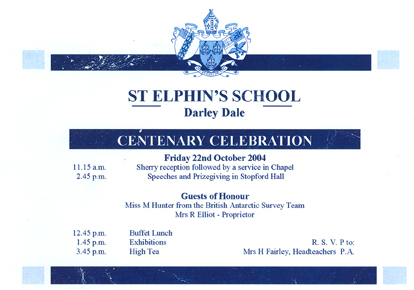 There was a Champagne Reception, Centenary Service of Celebration, Buffet Luncheon, Exhibitions, Speeches and Awards and culminating in the Cutting of the Celebratory Cake. Thanks to Christine Tew for providing the documents for scanning purposes. 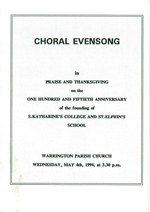 A Service of Thanksgiving for St Elphin's School was held at Warrington Parish Church on Saturday, 11th March, 2006 at 2.30pm (1844 - 2005). Please click on the image to the left to see the full programme.